WILLIAMSPORT, Pa. - Throughout the summer, athletics.lycoming.edu is proud to feature a series of alumni profiles that will help reconnect Warrior fans with some of the remarkable athletes who have worn the Blue and Gold. Today's feature is on Tim Deasey '01, the record holder for most rushing touchdowns in school history for the Lycoming College football team. Though Deasey was a full-time starter for just two seasons, he left his mark on David Person Field and on the Lycoming football record books. In his first season as a starter in 2000, Deasey rushed for 1,026 yards and 10 touchdowns, which led the team and helped it to a 7-2 record and the Freedom League title. In 2001, though, Deasey began to pull away and really make a name for himself. Deasey led his squad with 1,247 rushing yards, good for second all-time in a single season. 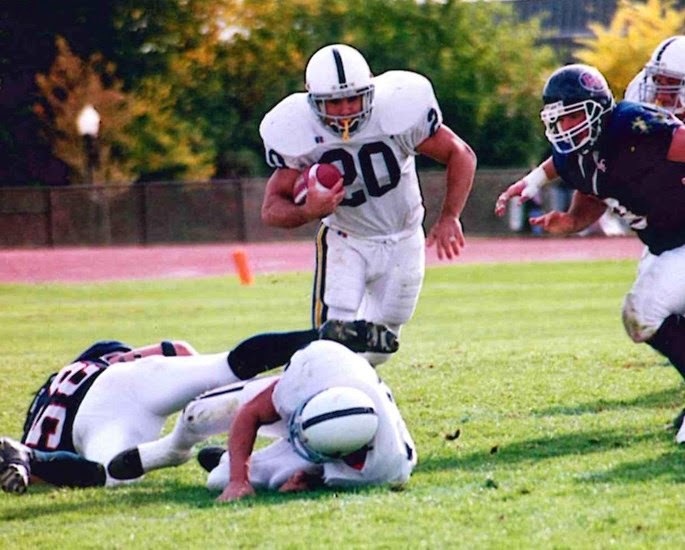 Also, his 14 touchdowns, 86 points and 138.6 rushing yards per game in the 2001 season are all still Lycoming bests. Deasey led the MAC in rushing yards in 2001. Deasey's best game in 2001 came against Juniata, when he rushed for the second-most rushing yards in a game with 242 and the most rushing touchdowns in a game with five. Deasey set the school-record for rushing yards in an earlier season game against Lebanon Valley, racking up 253 yards. Deasey finished his career with the most rushing touchdowns in program history with 29, and he graduated with the most rushing yards in program history with 2,868 (now third in the program record book), the second-best yards per game average with 84.4, the fourth most total points scored with 202 and the sixth most all-purpose yards with 3,190. Overall, the two-time First Team All-MAC running back is in the top 10 in nine of the school's career categories and in the top 10 13 times in single-season categories. Deasey was inducted to the Lycoming College Athletics Hall of Fame in 2012. Deasey works for Fidelity National Information Services, where he designs and implements mortgage software. Athletics.lycoming.edu recently asked Deasey a few questions about his time at the college and what advice he would have for today's football players. What was it like to break Lycoming's all-time rushing record and have the game stopped to honor you? What do you remember about that game? Breaking the rushing record was definitely the highlight of my college career. I really felt like all the hard work had paid off. It was not only a milestone for me, but more importantly, a testament to my team, especially my linemen. The big boys up front are the ones who took care of me and made sure I made it back to the huddle after every play. Having the game stopped was a nice touch and it made me feel like I was on top of the world for a few minutes. You were inducted into the Lycoming Athletics Hall of Fame in 2012. What was it like to come back and accept that honor and relive your Lycoming career? Being inducted into Lycoming's Athletics Hall of Fame is the biggest accomplishment of my life so far. It was really good to see a lot of my old teammates and prior inductees who made it to the ceremony. Looking back, I know I'll remember that night for the rest of my life. What was it like to play for Frank Girardi? I knew I was going to be playing for Lycoming and Coach G after talking to him for five minutes on my recruiting trip. G was a major aspect in my life at Lycoming, obviously through football, but more importantly, for me a person. He is not only the best coach I ever had, but also one of the greatest people that I've had the pleasure of knowing. What do you remember from the games when you broke the school record for rushing yards in a game against Lebanon Valley and broke the MAC record for rushing touchdowns against Juniata? I don't remember much of the Lebanon Valley game due to it being a blowout. We won, 40-0, so it wasn't a real exciting game. The Juniata game on the other hand is a different story. Juniata was the last game of the year and we were all under the impression that if we won, we would receive a playoff berth. The game didn't start out real well for us. Juniata went up by two scores and morale was dropping on the sideline. That's when I walked up to G and simply said, 'Give me the rock.' That's what he did. Forty carries and five touchdowns later, we walked off the field winning, 42-14. That was the best game of my career and again, I wouldn't have been able to do it without the big hogs up front and my fullback. We didn't end up getting into the playoffs, but I had the pleasure of walking off the field for the last time as a winner. I still get the chills thinking about those glory days. My favorite memories of being at Lycoming have to be the close-knit relationships that we had with each other. I feel blessed to have met the people I did and look forward to knowing them for the rest of my life. I not only consider those people my friends, but also an extension of my family. How did football prepare you for your future career? Football helped prepare me for my endeavors simply because it taught me discipline, work ethic and the drive to want to be the best that I can. What advice would you give to players on today's Lycoming team? My advice to the players of today is to work and play as hard as you possibly can day in and day out, because before you know it, you will be graduating and will never have the opportunity to put the pads on again. So don't take the game for granted and give it 100%, 100% of the time.